So true, and I’ve also been thinking about the women in the parsonage–those who support a husband’s career and lean into their own ministry calling in a less-visible role, perhaps, but nonetheless crucial. This is a good excuse to take my own P.W. out for coffee some time this month . . .
As a former women’s ministry leader for several years, I can tell you words of encouragement mean so much. Though we don’t minister for recognition, it is heartening when someone sees and acknowledges some aspect of the ministry and assures of their prayers. Thanks for reminding us to appreciate and recognize our women’s ministry leaders this month. They play such a vital role in ministry. I can think of some ladies who have influenced me so much. Yes, having a soft heart in a hard world is challenging. What a kind post. I am sure all the women’s ministry leaders out there who are reading it appreciate it! We don’t acknowledge our women ministry leaders enough, so yes, let’s do this! Thanks, Holley. 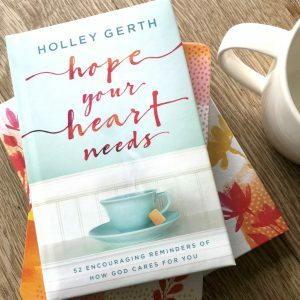 Holley… speaking of women’s ministry… I want to thank you again for the Fiercehearted Retreat. Meeting you was very special and hearing your heart, life-changing. Praying God continues to breathe new life into women through your words, both spoken and written. What a wonderful appreciation letter. I’m sure many will be blessed by it Holley! I’ll be forwarding it. Thank you! 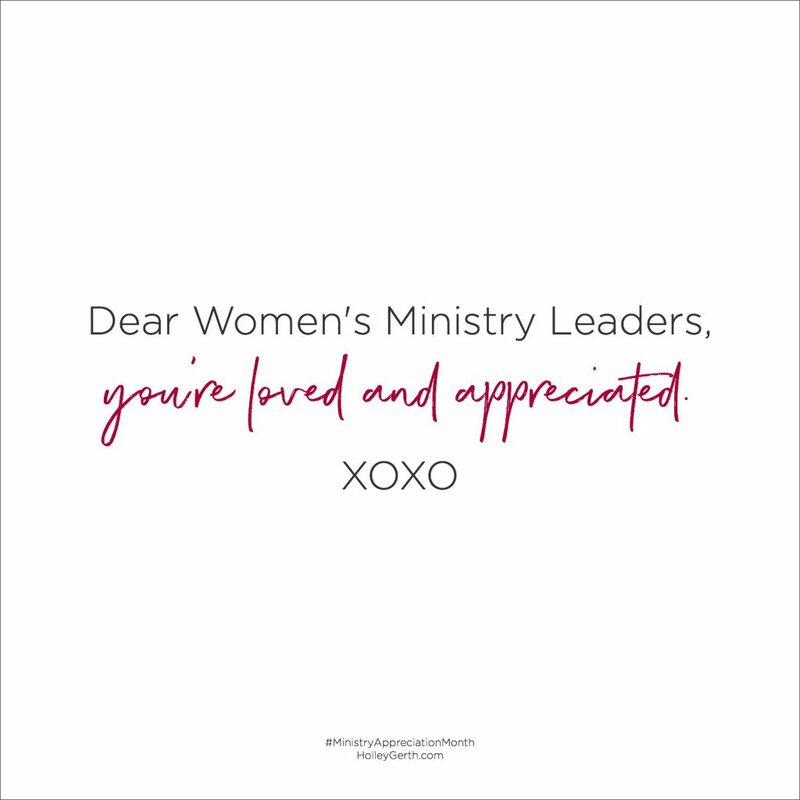 Thanks for helping me love on women’s ministry leaders! I’m grateful for all of you and the ways you serve too! Your letter of appreciation is absolutely beautiful and you described my own struggle to find purpose as if you knew me personally! The thought that came to my mind is something someone else said (can’t remember who) “Bloom where you’re planted”. I try to remember that God has brought me where I am for a purpose and if I trust Him then whatever, wherever I am is God’s purpose. Also, a thought occurred to me that no matter what we are doing, we are all in ministry if we are blooming where we are planted, whether it be changing the 10th diaper for the day, fixing dinner for the family, doing the family laundry, writing a report in my office, battling the freeway on my way to another appointment, attending another staff meeting, etc., etc., etc. 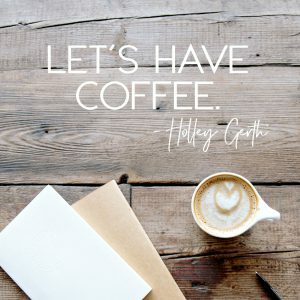 Holley this is the first time I’ve written a comment, but your words have inspired me so often and I want to thank you! How valuable to be connected with one another, how precious to care, how divine to share love in every creative way God Himself has deposited in us…His purpose, His plan. I rejoice in being a golden thread among God’s adorned family, and in being blessed and being a blessing to others whichever way He leads. O what amazing love He has wrapped us in. RECEIVE IT, GIVE IT, LIVE IT. Who doesn’t respond to love? Who doesn’t need it, want it, long for it? Unconditional love that God offers, promises, and fulfills in us, whom He totally loves. Our church loves our Women’s Ministry leader aka pastor’s wife. She wears many hats. She plays piano/organ for us several times a week & leads women’s Bible studies Now is acting choir director for our Christmas Cantata this year. She has a full-time job outside the home, works with several non-profits & Relay for Life. In spare time she likes to quilt & sew plus makes great homemade sour dough bread from scratch. We are blessed to have her & hubby in our lives/church for going on 30 years now. She and I are such good friends I have gotten her a Sheri Easter devotional book & Sandi Patty Cd. Women’s ministry leaders-especially p.w.’s don’t get enough recognition for all the little things they do.